Vauxhall has introduced its fully-electronic IntelliGrip traction control system on the all-new Grandland X SUV, ensuring the vehicle always remains stable on any surface. With five independent driving modes available, IntelliGrip enables traction and stability at all times by delivering optimal grip through the wheels. The driver can choose from five modes via a centre dial, with the IntelliGrip system immediately adapting engine and transmission control, torque distribution and ESP settings to ensure optimal contact to the driving surface. 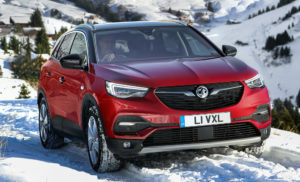 The innovative IntelliGrip technology is available with all powertrain combinations (excluding 2.0-litre (174bhp) diesel variant in Ultimate trim) of the Grandland X as part of the “All Road Pack” option, which also includes five-spoke, 18-inch alloy wheels and 225/55 R18 all-season tyres. The All Road Pack option can be selected for SE, Tech Line Nav, Sport Nav and Elite Nav model variants.